Copyright: © 2017 Krasnyak O. This is an open-access article distributed under the terms of the Creative Commons Attribution License, which permits unrestricted use, distribution, and reproduction in any medium, provided the original author and source are credited. This article features a method for teaching a History of Science and Technology (HST) course through content blocks for undergraduate students for non-science majors. I suggest starting the course with a block on cosmology, as this block provides a broad historical perspective, and a number of topics and controversial issues related to modern scientific approaches, and can be looked at through the lens of the nature of science (NOS) what allows students to reflect epistemologically on the issues discussed. I realize that the amount of information that must gather and incorporated is both massive and too specific, so I suggest ways to complement and update the included content. The role and importance of scientific literacy courses and how they might be applied to non-science majors is emphasized. The survey data showed students’ general satisfaction with the course and reflected upon some concerns that need to be considered in the teaching. History of science and technology, Teaching cosmology, Science education for Non-science majors, Nature of science. The traditional division of knowledge into two big groups-the sciences and the humanities is a centuries-old problem . Traditionally, humanities scholars were considered to be a part of the scientific community who should be separated from physical and natural scientists. Those stereotypes may be reasonable since the methodology and goals for Social Sciences and Humanities (SSH) and Science, Technology, Engineering and Mathematics (STEM) are different. However, the concept and the meanings of existing scientific disciplines are changeable and the distance between SSH and STEM gradually shrinks. The demand for science literacy courses in higher education creates a reality in which the boundaries between SSH and STEM disciplines are fading away, and the proper understanding of the nature of science (NOS) and epistemological reflection on scientific knowledge are required for people to navigate through a world led by science and technology. Liberal arts colleges, which provide broad and multidisciplinary approaches to the increased role of science literacy, might be a platform of rethinking the teaching science literacy for non-science majors. Liberal arts and science education are, at the core, imparting general knowledge and developing general intellectual capacities. However, the demands of non-science majors, in terms of science knowledge, still remain difficult to incorporate properly and should be supported through an interdisciplinary approach . In his book, Ferral  argues that liberal arts colleges promote an attitude toward learning and knowing, not of specified knowledge when, for example, a chemistry department welcomes classes on history and a literature department requires quantitative methods. Some controversy remains over the best pedagogical approaches to the apscience literacy courses for undergraduate students majoring in SSH (e.g. International Studies, Comparative Literature and Culture, Economics, Political Science and International Relations, Asian Studies, Justice and Civil Leadership etc.). Rather than discussing the requirements and meaning of teaching science literacy courses where we can refer to studies by Nelson , DeBoer , Norris et al. , or what will be the limitations of included scientific information or science knowledge into a course on the HST, I suggest combining both the aspects of history and philosophy of science, and science content through the example of teaching the cosmology block. The design principles of the course and arguments that justify the creation of the HST course and teaching cosmology in it will be shown respectively in the following section. We use Kragh’s  precise description of cosmology as a ‘potentially problematic science in which questions of a philosophical (and sometimes religious) nature cannot be clearly separated from scientific questions to observation and theory.’ Cosmology appears as an ideal candidate to investigate the concept of acknowledging NOS together with science knowledge interpretation in the teaching the course for non-science majors. Enabling students to learn NOS is commonly cited as a goal of scientific education [8-11]. A remarkably completed bibliography, which should be mentioned separately as one that provides the list of studies related to teaching and learning NOS, is suggested in a collective work by Bell et al. . Even though new research on NOS appeared over the next fifteen years, we believe that the bibliography still remains a core for the main principles of NOS as the goal of science education is similar. Understanding the link between science and society is essential for students of science majors and might be achieved through implementing the history and philosophy of science into science courses and education about science [13-15]. If examples of the inclusion of history/philosophy of science and NOS into the teaching science that has been shown effective, e.g. in teaching science disciplines such as genetics [16,17], and physics and optics [18-21], the teaching of HST for non-science majors is tricky. The question of what kind of relevant information to choose and which meaningful aspects to suggest in teaching the course, in order to acquire not only the history/philosophy of science, but an understanding of basic science, is unclear. Introducing students to the history of certain inventions is valuable, but simply listing historical facts in chronological order would probably not help the students understand the meaning of the historical background and NOS. For example, in many astronomy textbooks its historical development is listed anecdotally . It is also important to consider the ways in which the most valuable and influential directions of modern science might be shown properly. Approaches toward NOS for all specialisations indicate mutual interactions and benefits, for example, in the critical evaluation of science in the media. The overwhelming amount of science-related information that pops up in the newsfeeds of media daily should be epistemologically reflected, even if it is not understood precisely. To avoid any misleading interpretations, students are encouraged to consider basic perceptions of NOS, which leads to critical evaluation of science content represented in the media [23-25]. I wish to emphasize that NOS in the teaching of HST for non-science majors might be taken as pedagogical prerequisite that responds to broader objectives, e.g., related to liberal arts colleges education. Similarly, approaches to NOS appear to be more efficient in teaching sciences, for which evidence is limited and localized to certain subject matters. A brief bibliographical analysis of research papers on cross/multi-disciplinary approaches in teaching HST should be started with the most valuable and practically useful book in the field, that is, International Handbook of Research in History, Philosophy and Science Teaching . The construction and the content of the handbook follows its broad scope of interdisciplinary approaches and matches our arguments regarding the unnecessarily strong separation of STEM and SSH disciplines in teaching science literacy courses. Wide-ranging discussions which have been combined into three volumes are massive and incredibly important to making the handbook equally utilitarian for teaching science literacy courses to both science and non-science majors. Special attention was paid to articles related to cosmology  and astronomy  for justifying the teaching of the Cosmology Block for students majoring in SSH who lacked a scientific background. Enhancing the science literacy of students majoring in non-science fields and specific scientific fields and the teaching methods related to this are advocated in a number of studies. I chose several of them where the authors suggested similar approaches and methods in order to promote and effectively convey scientific literacy. Jin et al. distinguished the three components of science literacy: (1) knowledge, (2) inquiry, and (3) appreciation. Those components align with our proposal to combine (1) basic science knowledge which needs to be conveyed, (2) strategies for using the content blocks, and (3) the link between science and society, when understanding NOS and the interpretation of scientific knowledge might appear to be future oriented and could potentially be applied in public policy. In addition, a similar idea to content blocks, named units of inquiries or inquiry projects, has been shown to be effective [27-29]. Improving science literacy in chemistry for non-majors is promoted by Goff et al. . This study is applied in the teaching experience, borrowing the arguments of ‘what science is and what science is not,’ stressing that science is a product of social and cultural values, while scientific theories change with the appearance of new data and are usually connected with the casual effects. The authors successfully improved students’ understanding of the matter through investigating chemical phenomena for all civilizations. Gill  shares ideas on enhancing the engagement of students in non-majors science courses in large lectures. The results that were most useful to our study were that students spend more time analysing and synthesizing information than memorizing it. Gill concluded that despite the suggestion to vary the teaching-learning activities, students prefer standard lectures and video clips. Interestingly, the study by Hottecke et al. proposes a quite different approach and claims that students often have little interest in only reading texts or listening to talks, hence, facilitating a number of group activities, based on the enquiry approach for methods of teaching and learning, enhances students’ interests in science. We might assume that balancing between traditional lectures and students’ inclass activity will help to achieve good results in teaching a HST course. Another component worth implementing in the teaching of science literacy courses is multiculturalism. Western science and its history are traditionally justified as the core for scientific development on a global scale and are presented accordingly. However, multiculturalism appears as a starting point that needs to be considered when teaching HST. Dagher  argue that western science ‘can be reconciled with local indigenous knowledge systems.’ This statement is pivotal for the authors (with westerns science tradition backgrounds) as their teaching practice takes place in a Korean university. The justification of western traditions in science is still might be conducted as reasonable, however, with necessity of including information related to eastern science traditions. A very brief analysis of the literature reveals that teaching science literacy courses for non-science majors in liberal arts colleges is essential to (1) acquiring the concept of NOS and science knowledge regardless of major; (2) drawing students’ interests to examine scientific information and finding ways for the epistemological reflection and interpretation of it; (3) understanding the link between science and society. The block of Cosmology is our attempt to create a reasonable and methodologically-acceptable model that can be implemented into teaching the HST course. In the HST course, I tend to present the block first since it involves content which takes into account some fundamental questions that humanity has always asked and tried to answer about the cosmos. What is out there? What does the universe mean? Are we alone in this infinite universe? Is the universe infinite or does it have its edges? What are the practical purposes of knowing about the universe? What are the limitations for humanity in the penetration of outer space? Should human beings even go into the cosmos or should we remain here on earth? Will expanding knowledge about the universe bring humanity to the ultimate truth? What does the ultimate truth mean? There could be an infinite number of questions related to the cosmos and the universe. Such questions demand to be addressed but even when the best thinkers and scholars are able to solve one puzzle, many more unanswered questions appear. Human curiosity about approaching the truth rather than applying for utilitarian purposes, as believed, are the driving forces that motivated people to keep observing and penetrating the universe. Those questions might be applied toward understanding the scientific way of thinking and NOS. In the Cosmology block I suggest to include issues on how observations related to the universe contributed to the concept of ‘obtainable power,’ which we mean as useful scientific knowledge. Considering fundamental philosophical issues and their emotional significance about the cosmos, cosmology appears as one of the scientific disciplines which is usually questioned in terms of its practical usage. We assume that the meaning of scientific theories and their implications about the Big Bang, the expanding universe, dark energy and dark matter, and potentially habitable planets might be examined. In this case we suggest emphasizing the notion of useful scientific knowledge when it is looked at from the perspective of a state’s development that leads to progress, whilst scientific and technological progress is based on understanding the connection between theory and practice. I advocate a student-centered strategy to teaching the course that includes the full integration of students into the teaching process. When using such an approach, a professor is viewed less as a source of information and more as a regulator and helper in suggesting units and inquiries for discussions that will be researched and prepared beforehand and then brought up in class meetings. The benefits of student-centered instruction are numerous and well documented in the literature [34-38]. The simple transfer of information is not an option for the modern educational environment. Ruth  points out that the instructor now also plays the role of a collaborator, acting as a partner in the learning process. In the classroom, students are learning how to find information on their own, and this is reflected in society as, now more than ever, people are able to self-learn thanks to the wide, rich, and varied information provided by modern technologies. Accordingly, a study by Hottecke et al. suggests minimizing the guided approach to teaching science inquiry and advocates a variety of role-play activities that complement a student-centered strategy. Role-play activities are widely used in history classes and have shown positive results in history of science classes [40,41]. We realize that the Cosmology block cannot be covered completely but represents an attempt to touch on the most important and influential developments in this broad topic of science. The second strategy is the strategy of science content interpretation, which is a toolkit to distinguish complexity, historical context, analysis, and understanding of the related materials. This strategy differs from the teaching method of chronological narration (a succession of facts about the state of our common knowledge at different times) with the suggestion of answers on science material in a historical perspective, while dated statements contrast with contemporary knowledge about topics such as the solar system, gravitation, relativity, the universe, etc. To achieve this goal, we might refer students to additional explanatory services and resources which can be found on the web. In science content interpretation we propose the inclusion of visualizations. For example, the visualization of processes occurring in the universe (e.g. the Big Bang, a supernova) helps to develop our perceptions about these issues. We might look at existing technologies as tools that enable us to illustrate the processes on a larger scale. We suggest the broad usage of applications or software to create, build, and simulate ideas and perceptions, making them visual and realizable. Traditional chronological narration is reasonable when providing information of cosmological approaches which comes before modern times, approximately the history of science before the 20th and especially the 21st century. In a historical prospective starting from the period of the great civilizations of antiquity, the listing of the most important figures in science and philosophy, who shifted and changed existing perceptions about nature, is possible due to the relatively limited number of such historical figures. In contrast, when we discuss a variety of scientific approaches and the complexity of the modern cosmology, the chronological narration does not provide much help in systemizing information. In fact, the number of scientists who are contributing to the field of modern cosmology is increasing dramatically. We must further consider how current knowledge might unexpectedly become outdated when a new scientific theory or discovery appears. Conversely, a recent report of the detection of gravitational waves , demonstrates that theories and predictions which are based mostly on impressions and interpretations, such as the Theory of General Relativity, may also be confirmed when new evidence comes to light. Therefore, theoretical frameworks and various forms of indirect evidence must be considered carefully, as they can sometimes provide answers when observable evidence is unavailable. We suggest considering this sort of approach when forming views on cosmology. Another strategy is the democratization of sciences, which leads to collapsing the boundaries between SSH and STEM and opens the gates for wider contributions and multidisciplinary collaboration. Cosmology as a discipline should not be correlated only with science majors (e.g. astronomy, physics or mathematics) but should be accessible for non-science majors. We notice that students without scientific backgrounds usually avoid such issues and sometime abandon any attempt to look closer at cosmology-related topics. Our goal is to make students confident about obtaining information on the universe and less fearful when attempting to understand the complexity of it. In fact, the sheer number of cosmological theories surely indicates the controversy and lack of full understanding about the universe. We cannot promise that students’ understanding of cosmology will be clear or that all of their questions will be addressed, but we should strive to engage students enough for them to cultivate an interest in it. Taking into account own experience in teaching a number of history and HST courses, I may suggest teaching a HST course for non-science majors through content blocks. A mind map helps to visually organize information where the core element is the concept of NOS (Figure 1). 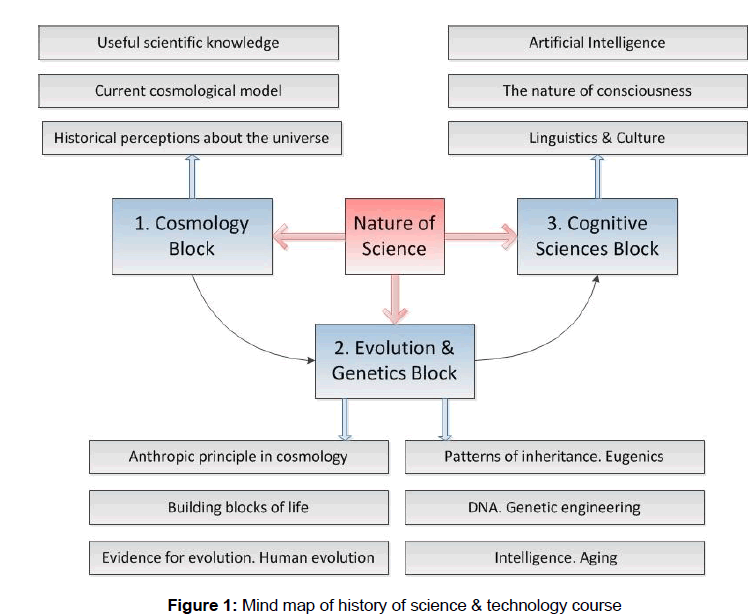 In a given course, we advocate the following content blocks: 1) Cosmology, 2) Evolution & Genetics, 3) Cognitive Sciences, in which the concept of NOS might be carried on throughout the course. Each block is considered a top hierarchical key element with its branches. The number of blocks and their branches is flexible and they can be combined with extra specialties, depending on the provision of special knowledge related to student needs or special scientific literacy requirements for different majors. For instance, our recent study on the teaching the cognitive sciences block through its linguistic component might be applied in the teaching of students majoring in linguistics . However, considering the common format of a 3-credit course for undergraduates with approximately 12 weeks of lectures and tutorials, excluding the weeks for midterm and final examinations, it feels that the presented number of blocks and branches is optimal. The content blocks and their branches are relevant to each other, can be taught in this particular order, and can complement each other. Since the proposed structure of the HST course differs from most history courses that students take due to the contents that are included and the thematic arrangement, I decided to assess students’ level of satisfaction via an inclass survey to collect data on their perceptions about the course. The questionnaires were passed through the three groups of students who enrolled in the HST class at English language Underwood International College of Yonsei university, Korea. Using a 10-point Likert scale ranging from 0 (totally disagree) to 10 (totally agree), students responded to statements about various aspects of the HST course, not only on the Cosmology block. In sum 68 surveys were received, excluding surveys not completed or completed incorrectly. The HST course is a part of the common core that students are obligated to take. All the students are majoring in SSH, and most of them have very little scientific background or only very basic perceptions taken from primary or secondary school. The majority of respondents were female students (78%) between 19 and 21 years old. We provide box- and-whisker diagrams showing medians and quartiles of responses. In Figures 2 and 3 we present a statistical breakdown of student satisfaction of the course according to gender. Male students were more satisfied and understood the course relatively better than female students. Also, the course content seemed to be less complex for the male students. We assume that in Korea female students are affected by stereotypically traditional perceptions about the role of women in sciences, hence their ‘incompetence’ to understand the course content rather than the matter of actual sentiment and learning. The proposed strategy of democratization of sciences might be applied in terms of shrinking gender imbalance in sciences and provide suggestions for how women could be more attracted to the sciences despite gendered cultural differences. In addition, grade outcomes are not usually affected by gender. As it realized, this abrupt statement should be proven accordingly and we plan to look at this direction in our future research. Most students were able to draw the link between the course content and current societal demands for understanding of phenomenon of science. Although, they found difficulties in imaging the course content as a whole and placing the content blocks properly. As a solution, we think that the mind map of organising the course through the content blocks should be explained more precisely and shown in the context of each class or at least for the transition from one block to another. The core element of NOS also should be stressed and shown more with the goal of understanding it more deeply. In general, the students indicated a proper understanding of the course content, even though the topics and information covered in the lectures were complex. An important observation is that students agreed that the course organization and the materials, represented in lectures, enhanced their comprehension of the discussed subjects. On the other hand, not everything was clear especially in recognizing patterns of cosmological theories. These topics remain difficult to understand. I would not say this was due to an instructor failure to educate the students properly but rather suggestions to point out certain directions to consider and to raise some questions about NOS and their implementation in the block on cosmology in their multidisciplinary approaches. I acknowledge that many students were freshmen and, therefore, did not have a great deal of experience with how college courses are organized, even though the survey was completed during the last week of the class. Otherwise, freshmen are the audience we must teach, and I acknowledge the importance of exposing freshmen to content of common core courses before they narrow in on a major. Future research should be done in regard to identifying ways to provide guidance for teaching HST to students in their early years of university. From students’ responses to the survey and the experience in teaching the HST course through the blocks, I observed that students found the course content and arrangement to be satisfactory and helpful. I aimed not only to deliver information but to provoke critical thinking and to encourage students to find their own interpretation when discussing the issues. I came to the conclusion that scientific theories and discoveries lead humanity to a higher acceptance of a new reality made possible by technology. The suspension of skepticism should be promoted in order to bring up new arguments and new scientific theories, which might enable us to jump into the next step of our perception about the world, the universe, and humankind. Vision of the universe became broader with the passage of time, so now humanity can look above and beyond it using modern technology. The idea of technology that will eventually be able to engage in the process of investigating science instead of us sounds reasonable. The mission for the following generations will be to provide proper explanations and new ideas. I believe that teaching the HST course through the content blocks will help educators to distinguish how science and technology have developed from antiquity to modernity as well as how those changes were possible and which other unexpected and unpredictable outcomes might follow. The literature shows that an understanding of the scientific way of thinking together with an understanding of scientific knowledge and NOS reflects the continuity of a scientific dialogue  between all people regardless of their major. I realize that identifying the broad scientific fields or the content blocks, e.g. Cosmology, Genetics and Evolution, Cognitive Sciences, as proposed, might be considered a logical combination. This interchangeable combination of proper interpretations of scientific knowledge and identifying the link between science and society, remain the results of multidisciplinary approaches in teaching this HST course through building bridges between SSH and STEM. The Cosmology block appeared as a reasonable candidate to convey the message of linking students from non-science majors with science-related themes through understanding NOS, the historical and philosophical backgrounds of scientific discoveries and inventions, a toolkit to grasp basic science, which ultimately leads to progress even if how it will be used in the future cannot be precisely foreseen. Our aim is more about raising questions than providing answers. Students try to reflect epistemologically and come to a conclusion that finding some answers creates more unanswered questions, which, in turn, leads humanity to produce innovations and to adapt to them. The changeability of scientific perceptions depends on technology and ushers in new theories and transformations of knowledge. The suggested block of Cosmology is an essential and pervasive topic in modern science. Discussing Cosmology in a HST course allows students to obtain basic scientific knowledge and a rudimentary understanding of the nature of science; reflects the requirements of higher education in promoting science literacy courses; and fulfills the demands of contemporary society to be updated in terms of scientific knowledge. Admitting ignorance and remaining open-minded with a flexible attitude toward scientific knowledge enables students to adapt to new situations and to follow the path of scientific and technological progress into the future. Snow CP. The Two Cultures And The Scientific Revolution. Cambridge University Press, England 1961. Ross K.et al. Promoting Science Literacy through an Interdisciplinary Approach. Bioscene2013; 39: 21-26. Ferrall VE. Liberal Arts at the Brink. Harvard University Press, Cambridge 2011. Nelson GD (1999) Science literacy for all in the 21st century. Educational Leadership 57(2). DeBoer GE. Scientific Literacy: Another Look at Its Historical and Contemporary Meanings and Its Relationship to Science Education Reform. Journal of Research in Science Teaching 2000; 37: 582-601. Norris SP and Phillips LM. How Literacy in Its Fundamental Sense Is Central to Scientific Literacy. Science Education 2003; 87: 224-240. Kragh H. The Science of the Universe: Cosmology and Science Education. Springer , Germany 2014. Hazen RM and Trefil J Science Matters.Doubleday, New York 1991. American Association for the Advancement of Science. Project 2061: Science for all Americans. Washington D.C 1989. Rutherford F and Ahlgren A (1990) Project 2061: Science for all Americans. Oxford, New York. Holbrook J and Rannikmae M. The Nature of Science Education for Enhancing Scientific Literacy. International Journal of Science Education 2007; 29: 1347-1362. Bell R, et al. The Nature of Science and Science Education. Science & Education 2001; 10: 187-204. Matthews MR. Science Teaching: The Role of History and Philosophy of Science. Routledge, New York 1994. Matthews MR. International Handbook of Research in History, Philosophy and Science Teaching, Springer 2014. Kohana O, Tal T. Understanding of high-achieving science students on the nature of science. International Journal of STEM Education 2014; 1:13. Kim SY and Irving KE.History of Science as an Instructional Context: Student Learning in Genetics and Nature of Science. Science & Education2009; 19:187-215. Williams CT and Rudge DW. Emphasizing the History of Genetics and Reflective Approach to Teaching the Nature of Science. Science & Education 2016; 25: 407-427. Seker H and Burcu BG. History of Science in the Physics Curriculum: A Directed Content Analysis of Historical Sources. Science & Education 2012; 21: 683-703. HadzigeorgiouY.Humanizing the teaching of physics through storytelling: The case of current electricity.” Physics Education 2006; 41: 42-46. Demirci N. Teaching the History of Science in physics classrooms-the story of the neutrino. Physics Education 2016; 51: 043003. Galili I and Hazan A. The effect of a history-based course in optics on students’ views about science. Science & Education 2001; 10: 7-32. Tignanelli H and Benétreau-Dupin Y. Perspectives of History and Philosophy on Teaching Astronomy. Philosophy and Science Teaching, Springer 2014. Elliott P.Reviewing newspaper articles as a technique for enhancing the scientific literacy of student‐teachers. International Journal of Science Education 2006; 28: 1245-1265. Majetic C and Pellegrino C. When Science and Information Literacy Meet: An Approach to Exploring the Sources of Science News with Non-science majors. College Teaching 2014; 62: 107-112. Leung JSC, et al. Understanding of Nature of Science and Multiple Perspective Evaluation of Science News by Non-science Majors. Science & Education 2015; 24: 887-912. Jin G and BiermaT. STEM for non-STEM majors: Enhancing Science Literacy in Large Classes. Journal of College Science Teaching 2013; 42: 20-26. Bannerman MD.Continuum-selecting inquiry-based experiences to promote a deeper understanding of the nature of science. Iowa Science Teachers Journal 2008; 35: 10-14. Baker DR, et al. The Communication in Science Inquiry Project (CISIP): A Project to Enhance Scientific Literacy through the Creation of Science Classroom Discourse Communities. International Journal of Environmental & Science Education 2009; 4: 259-274. Clough MP. The Story Behind the Science: Bringing Science and Scientists to Life in Post-Secondary Science Education. Science & Education 2010; 20: 701-717. Goff P, et al. Using a multicultural approach to teach chemistry and the nature of science to undergraduate non-majors. Cultural Studies in Science Education 2012; 7: 631-651. Gill R. Effective Strategies for Engaging Students in Large-Lecture, Nonmajors Science Courses. Journal of College Science Teaching 2011; 41: 14-21. Hottecke D,et al. Implementing History and Philosophy in Science Teaching: Strategies, Methods, Results and Experiences from the European HIPST Project. Science & Education 2012; 21: 1233-1261. Dagher ZR and Heering P. Science & Education in Educational Perspectives: Recognizing the Contributions of Michael R. Matthews. Science & Education 2015; 24: 821. Bonwell CC and Eison JA.Active learning: Creating excitement in the classroom.” In ASHE-ERIC Higher Education Report No. 1. George Washington University, Washington, DC 1991. Johnson DW, et al. Active learning: Cooperation in the college classroom. Interaction Book Compan, Edina 1991a..
Johnson DW, et al. Cooperative learning: Increasing college faculty instructional productivity.” In ASHE-ERIC Higher Education Report No. 4. George Washington University, Washington, DC 1991b. McKeachie W. Teaching tips, 9th ed. Heath & Co, Lexington 1994. Meyers C and Jones TB Promoting active learning: Strategies for the college classroom.Jossey Bass, San Francisco 1993. Reynard R. The Changing Role of Instructors Moving from Facilitation to Constructive Partnerships. THE Journal 2010. Duveen J and Solomon J The great evolution trial: Use of rope-play in the classroom. Journal of Research in Science Teaching 1994; 31: 575-582. Monahan WG. Acting out Nazi Germany: A role-play simulation for the history classroom. Teaching History: A Journal of Methods 2002; 27: 74-86. Abbot BP, et al. Observation of Gravitational Waves from a Binary Black Hole Merger. Physical Review Letters 2016; 116. Krasnyak O, et al. Linguistic Approaches in Teaching History of Science and Technology Courses through a Content Block on Cognitive Sciences. Journal of Language & Education 2016; 2: 32-44.